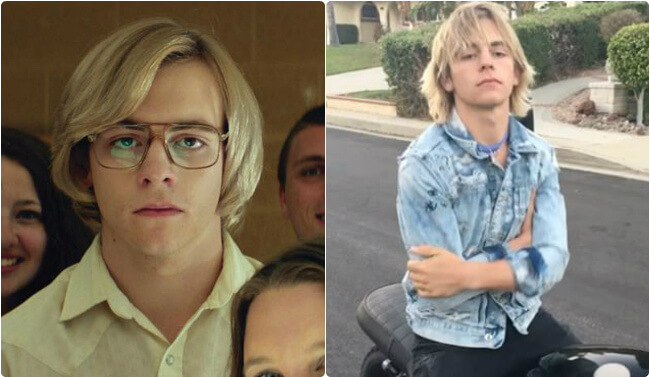 We’ve been waiting a while to see the first trailer for My Friend Dahmer, the biopic based on the early life of gay serial killer Jeffrey Dahmer, starring ex-Disney Channel star Ross Lynch. And now, the trailer is finally here, with Ross (as handsome as usual) looking creepy – and pretty scary – as the infamous killer. Jeffrey Dahmer was a serial killer who raped and murdered 17 men and boys from the late 1970s to the early 1990s. Dahmer’s murders involved dismemberment and cannibalism, and he was eventually sentenced to life in prison. In 1994, he was murdered in jail by a fellow prisoner. My Friend Dahmer, written and directed by Marc Meyers, is based on Derf Backderf’s graphic novel, and shows Dahmer during his high school years. The film was shown at the Tribeca film festival, but hasn’t been widely released yet. In the new trailer, we see Ross, as Dahmer, acting up in school, developing his muscles, and building an eerie relationship with his doctor, played by Vincent Kartheiser.